ECM's DIS1000 is a remote display for the AFM and FA series air-fuel ratio modules. 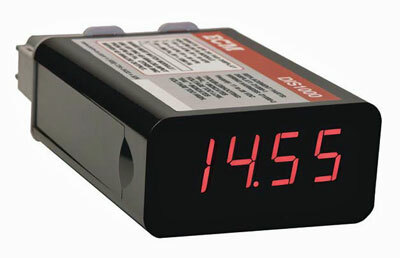 The DIS1000 packs tall (15 mm) LED numerals into a small (68 mm x 32 mm x 100 mm) package.Easily read in bright sunlight and not distracting at night, the DIS1000 is perfect for in-vehicle (top-ofdash,in-dash, below-dash) and remote dynamometer applications. The DIS1000 comes witha 6' harness that connects to an 11 to 28 VDC power source and the analog output of theAFM or FA module. The harness can be extended by using common pre-made BNC cables. The DIS1000 remote display is the perfect accessory for any AFM and FA series air-fuel ratiomodule: AFM1540, AFM1500, AFM1000 (standard and "b" version), FA1500, and FA1000.